Love keto waffles? Want to know the secret to why I am winning waffle awards? Read on and watch the quick cooking video. Oooh, and did I mention these keto waffles are only 2.5g net carbs each AND can be frozen? You know what means, right? This is the perfect meal prepping recipe that’s KETO and convenient. Whip up a batch and freeze for busy weekday mornings! I found my waffle maker at the back of the cupboard a few weeks ago and was just about to throw it out when I looked at the old recipe I used to make all the time and decided to adapt the recipe we once loved, but remove the flour and the sugar. Well, my waffle maker lived to see another day and my children say they like these keto waffles better than the high carb version we used to eat. Each low-carb waffle is not much more than an egg, coconut flour and some butter (plus a few other ingredients to make them rise and tasty). My old recipe that arrived with the waffle maker, requires 2 cups of flour and 1 cup of sugar. I can’t believe I used to make them on a regular basis (and then there was the additional maple syrup or golden syrup that was added on top). But most high carb recipes can be adapted if you know how. I replaced the wheat flour for coconut flour and replaced the sugar with sweetener and plenty of vanilla. What resulted was the most amazing, light, fluffy, tasty keto waffles you can imagine. 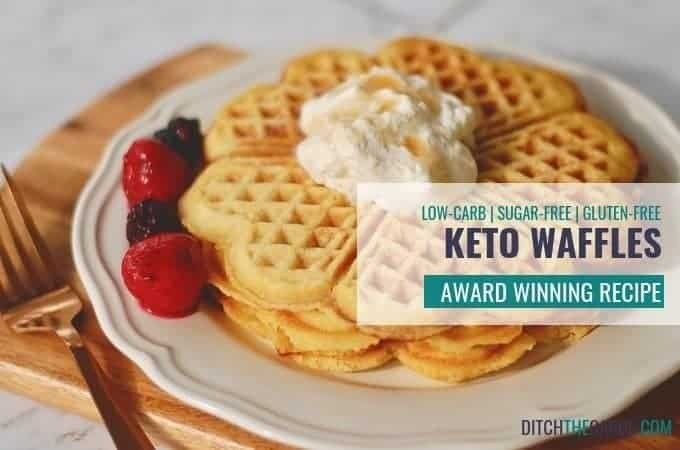 I have tried many low carb and grain free pancake recipes over the years, and I can hand on heart say these keto waffles are the best. What’s even better, is that there are no complicated ingredients, no added sugars, it’s grain free, there’s no protein powders, and uses ingredients we will all have in our cupboards. So give these a go and see what you think. They can even be frozen in between sheets of baking paper/parchment, in an airtight container. These keto waffles are so versatile. These waffles can be made in the waffle maker, or if you don’t have one, can be cooked in the frying pan, just like a pancake. Add some cinnamon or ginger if you like different spices. Make an extra batch and use the keto waffles cold as a ‘sandwich’. 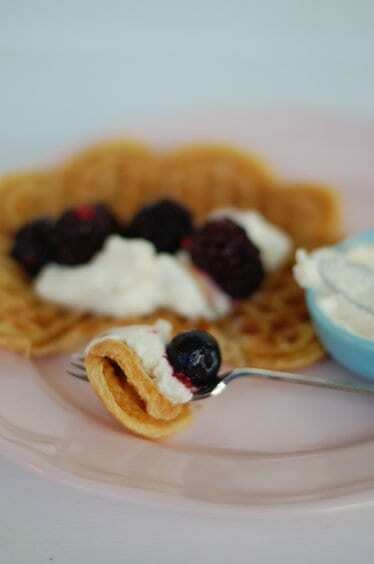 Cut each waffle in half, spread each half with cream cheese and add some berries inside as the filling. Or how about cutting them into individual pieces, toast them and use with a low carb ice cream. Best Keto Waffle In The Entire World Award! I have been keto for three years now. Every darn time I see a new low carb/keto waffle recipe on Pinterest, I get all excited, dust off the waffle iron, throw some bacon in the oven, and about a half hour later the air is blue with expletives as I curse the liar who swore their recipe was just like the “real” waffles of my past. Up until now they have all been crap. Today was different. Big time different. Life altering different. Angels singing in my mouth different. Even my husband, who is unimpressed with all things Keto, couldn’t stop saying Wow… WOW…. These are legal??? Libby, you have just won the “Best Keto Waffle In The Entire World” award, which is apparently just my undying gratitude. You have changed my life for real, because now I can be excited about weekend breakfasts again. You are a Keto Goddess and I bow to you. Keto waffles are my award winning breakfast that has won over many high-carb lovers! Keep any extras and use them as sweet sandwich bread for school lunches. Place cream cheese and berries inside for a yummy lunch box. Mix the egg yolks, coconut flour, sweetener, and baking powder. For other breakfast ideas, take a look at my recipe finder. Yum. My husband doesn’t even like waffles and he liked these. Thank you for the keto alternative . Omg I finally scrolled down far enough to leave a comment! After scrolling down far enough to finally find the recipe. Am I the only one that just wants the recipe without a whole life story to go along with it???? This is actually a good one if you can make it to the end. Hahaha yess! Totally could have gone without the life story!!! Eggy. It can’t help but be eggy because of all of the egg whites. Not crispy. Baking them to dark brown helped a little with crispy. Oil on my lips and tongue due to more than 1/2 cup of butter. Needs salt. I’m going to try reheating in the oven to see if they get crisp. I have a double Waring Belgian waffle maker and the batter came spurting out if I filled more than 1/2 way, but it also gave me waffles with holes. I wouldn’t say a waste of ingredients, but I probably will not make them again. It was a fun experiment. They were moist and rich and topped with small amt of Canadian Maple Syrup! 1. My kids loved them and wanted more. If that doesn’t rate 5x stars, I’m not sure what would! 3. I wonder if those people who experienced ‘flat” waffles had either not beaten the whites well enough, or were too heavy-handed with the folding of mixtures. Or both? Either way, mine were perfect. 4. I added about a tablespoon of sugar free maple syrup to the yolk/four mixture when I added in the vanilla, mainly because that was all I had left in the bottle and I didnt fancy squabbling kids complaining that one got more than the other… Anyway, it worked a treat and provided enough of that maple syrup flavour that they were happy to eat them just like that. Winning again! Awesome Sarah, thanks for the brilliant feedback. We love them too, and my kids even make them at the weekends. Have you tried the pizza waffles yet? Really great when entertaining kids because you can make the pizza waffles ahead of time, then just get the kids to add their own favourite toppings. Guaranteed to be eaten because they chose what toppings to include. I’ve been reading some of the comments, and honestly, it’s not the recipe that is the problem. It’s the person making the recipe and their perception of what it “should” be. What they are not thinking about is the fact this is low carb cooking and nothing will ever be the same as if you used regular flour. My husband balked at Keto for a good year until he was “forced” to follow it due to his diabetes. One of the reasons was he “hated” the bready things that were made keto. I gave him nothing of the sorts during his first month. Then gradually worked in sweets. Last week I made Keto Pizza and he LIKED it. I made a microwave cake for him last night and he LIKED it. I made your waffles this morning and he LIKED them. He likes these foods enough to keep eating because he didn’t try to substitute immediately. He just didn’t have it. As for these waffles, sure, they are soft when you take them off the iron. BUT when you get them on your plate and they cool a little, they firm up! We actually made sausage and cheese sandwiches with this recipe and it was excellent. You get a 5 star rating and my appreciation for sharing your recipes with those of us who really need them in our life. Thank you so much! Hi, absolutley love these waffles! I am wondering about how many servings your recipe makes though, because it says 1 serving is 1 waffle. I have a mini waffle maker, so I’m trying to figure out about how many I should have. The reciep makes 5 waffles for 5 servings. if you have a mini waffle maker, count how many waffles you managed to make then divide by 5. Well, after trying this recipe with 4 LG eggs instead of 5 medium, I’m not terribly impressed. The batter only made 3 waffles vs the 5 it was supposed to make and like someone else said, the batter began to separate. I followed the recipe other than using 1 less egg since I used lg eggs and I also used less sweetener. After trying a different recipethat essentially called for a tbsp sweetener per waffle, I knew it would be too much for my tastes. The waffles did come out looking like waffles, but they were so eggy that they were more like omelettes with coconut flour inside. I mean, yeah, these are keto and not gonna be like the real thing, but as far as consistency and density, they are probably the closest thing. Flavor-wise, just too eggy. I would give this a 3.5 rating, but couldn’t give it a 4, so had to go with 3. But thank you for this option. It sounds like some people don’t think they are too eggy, so at least it’s a great option for them. I appreciate that you took the time to experiment and come up with something fairly close. I was craving waffles, and my beau brought over some fresh raspberries. I made these exactly per the recipe, and they were delicious. We topped them with some whole yogurt, some whipped cream, and those fresh raspberries. Fabulous! Better than wheat flour and sugar waffles any day. And I’m so tired of almond four, it was great to find your coconut flour recipe. I use a lot of your recipes – Thank you!! Turned out great for me! I was looking for something low carb that wasn’t the egg-banana pancakes and found this recipe. I used the flour I had on hand (cup4cup gf) and sweetened with pure cane sugar. I folded in some blueberries after the egg whites and cooked these up like pancakes. When cooked through they are the beautiful golden-brown you’d want in a pancake! I can see these beating made savory with bacon, ham and/or cheese folded in without the vanilla or sugar. Yum! These are fabulous! I added a bit of banana flavoring to the last batter – what more is there to say! Thanks for the great recipe. Awesome flavor. Not too eggy as some say. But as someone else said, more of a french toast then a waffle. I am a big waffle guy and now on Keto. I realize, I will not have the same taste as a real waffle on Keto but these are a good substitute. Got to go in it with the idea, these will not get crispy. I tried cooking longer. I tried toasting after. Just go with what they are ….. great tasting french toast without the bread. Yummy. I will do them again. 4 stars not 5 since described as crispy which should be changed. All the negative comments just baffle me. My guess is that there are a lot of people out there that just can’t cook, or follow directions in a recipe. These waffles are one of the best “keto” breakfast foods I’ve encountered. If you are complaining about them being eggy, you are doing something wrong. If you are complaining about them not being crisp, well when you find a “keto” waffle recipe where they come out crisp AND good and low carb, let us know. In the mean time, I’ll continue making this recipe and enjoying these low carb waffles. I agree. Not eggy at all. Best Keto recipe that I’ve made! Absolutely wonderful change for breakfast. Was not wanting eggs and bacon (again) and I’m a very picky eater so decided, I’m going for this! I’m not a cook by any means! No kitchen skills so I’ve been really challenging myself! This was very easy and quite tasty! The only thing was that I only got 3 waffles instead of 5. Maybe I did something wrong?!? Not a fan when they come out hot. But a day later after being in the refrigerator they are the closest thing to my mothers home made bread pudding. Great for a sweet snack. One waffle without anything else quenches and sweet cravings. Hello from Spain!!! Thanks for the recipe!! They were delicius! I will nake them again for sure!!! 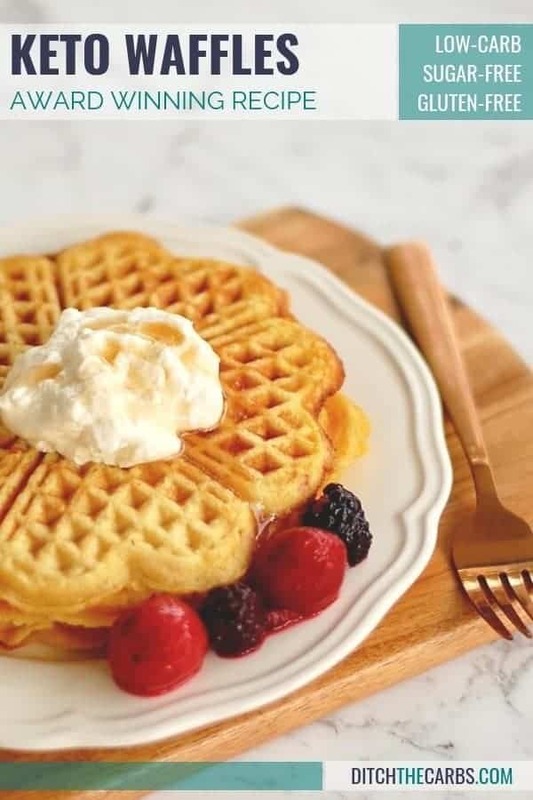 Yes, it is definitely 125g of butter, and yes it is in the video at the beginning when all the ingredients are shown 🙂 If your waffles were greasy, it may require you to add a little more coconut flour. It is 1 stick plus 1 tablespoon n of butter. It appears to be 1 stick plus 1 tablespoon of butter per the U.S. measurements. 125 grams is a little over 1/2 a cup NOT ONE CUP! I am allergic to Coconut. It is the only thing I am allergic to. All other nuts are fine. Almond four… can it be substituted and if so is the quantity different? These are definitely the best KETO waffles I’ve tried! 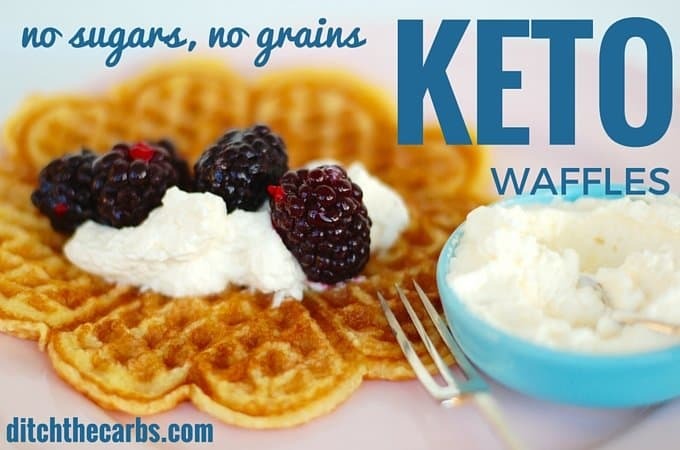 Emphasis on the keto, because anyone attempting a low carb waffle just needs to come to terms with the fact that you are not going to achieve the texture of a traditional flour-based waffle. You’re just not, so adjust your expectations and appreciate these for what they are! I found the texture to be both fluffier, less grainy, and less “eggy” than other low carb recipes I’ve tried. Swerve was my sweetener of choice and the amount called for in this recipe, combined with the vanilla, gave them a good level of sweetness. My husband and I enjoyed them with a little bit of diced strawberries and a side of bacon. This will be my go-to weekend recipe – thank you!! YAY – the voice of reason! I totally agree. So many “products” we were once used to, are manufactured and designed with all added nasties to make things crisp, crunchy, or chewy etc. Once we understand that keto alternatives made with real food (not keto “products” which in some cases are just as bad as the originals) then we open up a whole new world of delicate, natural flavours and textures. I personally got flat and soggy waffles from this, no hint of crispness despite cooking longer also. Any tips? I’m new to Keto, and am going through the food list. I’ve noticed in some recipes (like this one) milk is listed as an ingredient, but it is on the Foods to Avoid list? I know for this recipe you can use cream, which is approved, but then why even list milk as a possibility? I am just trying to wrap my head around what I can and cannot eat. Thanks! Yes, you may use cream. The problem with all the “allowed” or “avoid” lists is that those lists generally list what is higher in carbs so should be avoided in large quantities. So you may use milk, it should just be in a small volume or calculated into your daily macros. What is important is having low enough carbs to be in nutritional ketosis. Serving size is 1 entire waffle – yummo! I don’t know what kind of award this recipe would win, a waffle has GOT to be crispy. And just by looking at the pictures, it looks limp and soggy, eccch! It literally looks like I could use it like a sandwich wrap or a tortilla. That’s not the sort of thing that works for a waffle. I don’t even want to try the recipe. If you don’t have anything nice to say, but quiet. I want to make them more than ever NOW! I made these this morning with some skepticism, and they came out delicious! The were not crispy, but they were tasty and and my husband said to keep the recipe and make those again! That right there is a compliment. I might try this recipe as pancakes also. I will definitely be making these again. Lydia nailed it without cooking a single waffle! I just made these and her review is spot on! Hmmm… well I am in the middle of making them right now. I have zero idea what all the negative reviews are about. My waffles have turned out really well; tasty, fluffy, and well risen. Perhaps all these people who have less than desirable results haven’t beaten the whites properly, or were too heavy-handed with their folding technique. Either way, I’m more than happy with my result – I only wish I could attach a photo to show you all! The “waffles” ARE soggy. They are eggy and have a coarse texture once bitten into. This recipe doesn’t live up to the hype. I’m often amazed at how different the reviews on the same recipe are, and I assume we are all absolutely sure that we followed it to a T. And I’m no different. Sooooo…these are delicious! I used heavy cream thinned just a smidge with unsweetened almond milk. Otherwise I followed it precisely. But fluffy? Crispy? Absolutely not. Not when cooked as my waffle iron instructed, or even twice as long. Not when I greased the iron with real butter before each batch. Not even after leaving out to cool. In fact, they were so flat that they barely retained any indentations at all! Fortunately, they are absorbent enough that the butter and keto syrup didn’t just run off. I made a double batch. Before I got half way through cooking them, the batter had begun to separate ..nothing that a gentle stir couldn’t fix, but unexpected. Because others have reported they didn’t crisp up in a toaster, I won’t hold out hope. But I’ll still try. Will I make them again? I dunno…I think I’ll keep looking and experimenting. But if nothing better pops up, yeah, I’ll probably be back. Thanks for your hard work and sharing your recipe. This recipe is terrible. I couldn’t even force myself to eat one bite. Very snotty, gooey consistency. Complete waste of my time and groceries! We followed the recipe but didn’t have the positive experience others noted below. They may be ok for keto waffles, but just don’t taste like waffles…or much of anything really. We make fabulous GF waffles, and these, well, they were tolerable covered in applesauce, cinnamon & fruit. And watch your waffle iron closely b/c they cook VERY quickly. Very eggy, and not crisp at all. They were okay, but definitely not what I would consider a “waffle”. They tasted more like French toast sticks. The recipe calls for 125 g butter melted; how much butter is that in tsp or tbsp? Thank you! This recipe is terrific. I ate mine plain (yum) and gave them to my kids with some strawberries and whipped cream and they were devoured in an instant. My middle child says these are the best waffles ever and #3’s face with the first bite was better than any words, which is great since he is my carb addict! Now I need to make a double batch and freeze them so the kids can have them before school. LOVE this recipe! Using the waffles right now as bread for a bacon chicken sandwich!!!! I must have done something wrong because my waffles tasted like I put an egg in the waffle maker and fried it. Couldn’t eat them. Did you add the sweetener and vanilla? It sounds like maybe an ingredient was accidentally omitted. These are my favourite waffles by far. Absolutely the best keto-friendly waffles ever. Thanks for sharing! Wow am really pleased with these waffles. So tasty and easy to make. I used a sandwich toaster an they came out smashingly. OMG this is delicious. I finally found something Keto I like. Every bread I’ve tried I have either not liked or it’s just eh. These waffles were wonderful. I cut the recipe in half since I”m the only person on Keto in my family. I also totally forgot to to separate the eggs. I noticed this after mixing all ingredients. So I whisked it before putting it in my waffle iron. It didn’t matter. They were light and fluffy and delicious with nothing but butter on them. Thank you so much for making me a happy girl. Awesome!!! And did you know these are great to freeze? You can make an entire batch then freeze the remainder in an airtight container, with a piece of baking parchment in between each waffle, then bring one out at a time and pop them in your toaster! Genius I say! I made these today; they’re about as close as you can get to normal waffles. I’m pleased! I am wondering why your recipe has the carb count so low? I use cronometer.com which has all the official databases and is very accurate. I personally don’t like MPF as there are too many user-added entries and depending on the country of origin of foods, the nutrition panel may show either total or net, but it may not be clear and therefore lead to very inaccurate calculations. I also don’t include erythritol in my calculations. It is a non-absorbable carbohydrate. This may explain the variations in calculated values. Absolutely amazing!!!! I am truly impressed. I’m always looking for a nut free recipe so that I may share with my toddler who has a nut allergy. He absolutely loved them. I added lilly’s Dark chocolate chips to them. What a sweet treat. Question: could we double the recipe and bake these into muffins? Yay – my absolute favourite comments are those that involve children discovering new recipes. He might also like my Paleo pancakes. My 11 yr old makes them most Saturday before football and adds 2 tbsp cocoa to make them chocolate flavour. As for making keto waffles into muffins? I’m not sure if that would work. I am guessing, but I think they would be more successful as mini muffins than traditionally-sized muffins, purely because the eggy buttery mixture can have a tendency to “split” which isn’t a problem in waffles as they are cooked both sides, but as a large muffin, you may find it in two layers. I used my regular waffle maker for this recipe. The batter was very thick (I did use heavy whipping cream) and would really only have made about 3 waffles, at best. However, despite the fact that I sprayed with Pam Coconut Oil Spray before cooking, the batter completely stuck to the waffle iron and I had to use a knife to scrape it from the iron. That said, the chunks I was able to salvage were sooooooo scrumptious! What an incredible treat…delicious!!! Any tips on how to prevent this in the future? I’m soooooo glad the chunks were delicious, despite the fact they stuck 🙁 . I’m wondering if you added enough butter to the recipe? My batter is generally medium in thickness and the butter (as it melts within the batter) makes the waffles almost non-stick. I also have a regular waffle machine (from Fly-Buys) and it makes 5. If your waffles are thick, then I also wonder if that is why they are sticking? You could even try cooking these in the frying pan too. Hope this helps. Also whipping the egg whites properly and making sure not to crush them. I made a double batch using large farm eggs, and it came out amazing, if maybe a little dry. I was pretty pleased with these! They did not crisp up for me but I don’t necessarily attribute that to the recipe. It does have over a stick of butter so I wasn’t expecting it to ever crisp up but we’ll see what the toaster does for the leftovers. One note to American readers: the recipe calls for 5 MEDIUM eggs. We often use large eggs here so this recipe only needs 4 large eggs. That may be why some makers are disappointed with the eggy taste. These have held me over during my trip with gestational diabetes but I can’t say I’ll be swapping my usual waffle recipe for these permanently. I can’t use sugar alcohols, is the bulk of the sweetener necessary for the recipe to turn out? I will add a couple of drops of monk fruit sweetener to sweeten the waffle. Can’t wait to try them! I am so excited to try the worlds best waffle! I can’t do sugar alcohol granulated sweeteners. Is the bulk from the sweetener needed in the recipe or will it be okay if I don’t use it and add a drop or two of monk fruit liquid sweetener? Idk what waffles yall are eating. But these were the grossest waffles i have ever laid my tongue on. Horrible. All I can say is wow, these are absolutely delicious. These will definitely become a staple for my breakfasts on a weekend! I love them. Well worth the little bit extra work. Beautifully light and fluffy. Thank you, thank you, thank you. I don’t know what I am doing wrong, but I’ve tried to post three times and it’s not showing up. Is the granulated sweetener necessary to bulk up the recipe or can it be left out? I can’t eat the sugar alcohols and would just add a few drops of monk fruit drops to sweeten them. Sorry, no. Almond flour and coconut flour work in completely different ways. This article, The Ultimate Guide To Coconut Flour vs Almond Flour, explains everything. Literally the best waffles in general! I’ve never had such crispy, fluffy waffles in my life. These are perfect! Awesome recipe, make it!!! I was a little scared to try this recipe due to a few of the comments saying they were eggy or had a weird texture… but I decided to go ahead and give them a try anyway…. I’m so glad I did! Mine did not taste eggy at all and the texture was perfect! I made half of the recipe, subbed cream with almond milk to save on carbs, and used half the amount of vanilla and used maple extract for the other half 🙂 Really good. It made me close to 3 full waffles, and it was only 3 net carbs for the full stack! What kind of sweetner did you use? Take a look at my Ultimate Guide To Low-Carb Sweeteners. And here is what I keep in my pantry. I also add ingredient links in the recipes, and below the recipes, some Amazon links. I have updated that link. You can get them here on Amazon or if you are in NZ and AUS, from Fly Buys. It is such a useful kitchen gadget to have on hand. Is the serving size 1 full waffle or. 1/2 or 1/4th of waffle? I just made these and am eating them while I type. The texture is DEFINITELY not that of a waffle, so don’t get excited about that aspect of it. I followed the recipe to an absolute T and these are very dense. The coconut flour is very noticeable. They never firmed up. They are as soft as a soggy waffle. I tried leaving the 2nd round in longer to get crispier, but that doesn’t work. No matter how long I left them in, they never got crispy. They LOOKED crispy/brown, but they weren’t. I even took 2 out and put them in the toaster and they still never got crispy. I tried adding butter and they still tasted bland. I added chocolate morsels… still bland. I expected a lot more from this recipe with all the reviews. Maybe I’m just new to the taste of the low carb world, but these taste NOTHING like a waffle — at all. I made these per the recipe and they were crispy. I coked them on the higher setting on my waffle iron. Then I placed them on a cookie rack which worked out great. The next day I toasted the leftovers and made a BLT! This is by far the best “bready” type food for Keto. IM going to try thevrecioe savory. Maybe some thyme/rosemary and Trader Joe’s bagel seasoning with cream cheese. Yum. I had the same experience with them being too floppy to satisfy me as a waffle, BUT they made great low-carb pancakes. I add 1/2 tsp ginger, 1/8 tsp nutmeg, and 1/4 tsp cinnamon to the batter and cut the sweetener to 3 tablespoons. Also, I by large eggs, so only use 4 rather than 5 medium called for in the recipe. Hi Libby – just made these and even though I wondered if it would taste eggy, it did turn out fab, and looked like the real thing when it came out of the waffle iron. I did a couple of tweeks which I was happy with – a tsp of psyllium powder and a teaspoon of apricot kernel oil for that almond essence taste that I love in baked goods.10/10! BTW I love your coconut flour based recipes! The other recipes I use heaps, which I think are pure genius, are the coconut shortbread cookies, focaccia bread made into bread rolls and the hot cross buns (I add a couple of drops of orange essential oils to it – amazing). Thanks for your genius! Love your work!!! Awesome feedback Karen. I absolutely love it when readers tweak my recipes and come up with their own combinations. I love the idea of flavoured oils. What a great way to add some zing and to “pimp” recipes – love it! Can i substitute with Almond meal? I’m afraid not, they work in completely different ways and can’t be swapped 1:1. Read this article Almond Flour vs Coconut Flour as it explains how they differ and how they can be used. I threw the waffle iron out, but I still have a griddle in storage. What changes does it take to make this a pancake recipe? You don’t need a waffle maker (although they do turn out pretty). You can even make these in a traditional frying pan as pancakes too. Can this be made with just egg whites? I have a yolk sensitivity. I have never tried but I think you would need the fat form the egg yolk. Has anyone here tried this recipe just with egg whites? Any advice for Beth? Are these supposed to shrink coming out of the waffle iron? I just wanted to make sure I’m not doing something wrong. They taste GREAT and I’ve made them 4 times already. My boyfriend no longer misses his hotel waffles! Can you refrigerate the mix and use next day? We loved these btw and these were our first Keto recipe. Will definitely be trying more ! Also can you use almond flour instead?? I have never kept the uncooked batter, I fear it may split. You can however make a double batch and then freeze the left overs (if there are any). They are perfect for a quick breakfast, snack or lunch box filler. Almond flour would be amazing, but that would have to be a new recipe entirely. You may want to read this pos – Almond flour vs Coconut flour. And look at these 19 top low-carb pancakes, many of them use almond flour and are yummmmmmm. Gave up reading the hundreds of positive comments but can’t resist adding mine! AB FAB!!! I made half quantities to try them out and used 3 eggs – totally forgot the baking powder but with the extra egg didn’t need it! They were totally yummy – also found it hard to believe they were absolutely LEGAL!! Next time will try a savoury version. THANKYOU! THANKYOU! THANKYOU! Didn’t it call for five eggs? Hi, is there anything I could do in place if milk? If not will the recipe still turn out good without milk? Thanks! Yes you can use almond milk or another dairy free alternative.it’s only in there so the waffles are a little lighter. Feel free to omit it entirely. Hi! I am so excited to try this!! I use Now Better Stevia Organic Extract Powder. I also have some Truvia packets. How do I do the conversion for 4 TBLSP of what you use? I never give conversions for brands because they are so different and change all the time. All the amounts I use are spoon for spoon instead of sugar. So if a recipe states 4 tablespoons, take a look at your brand, and see how much is the equivalent of 4 tablespoons of sugar. Sorry I can’t be more precise, as you can imagine, there are new brands out there almost daily. I also suggest with all my recipes, add sweetener to YOUR taste. We all have a completely different “sweet tooth” to one another depending on how long you have been sugar free. Some may need to add a LOT more, some may want to reduce it. We don’t want to rely on sweet flavours too often. All my recipes now have a conversion button below the ingredient list. Press the large red buttons to swap between grams and cups. Warning: Don’t make these if you don’t want to have little clouds from heaven in and around your mouth. For those of you saying you want them crispy, spray your iron with lots of pam and leave it for an extra minute. That should crisp them up on the outside. That doesn’t work. I just made these. No matter how long I left them in, they never got crispy. I even took 2 out and put them in the toaster and they still never got crispy. Like several others I tried “someone else’s recipe” and it just had the wrong wrong texture – crumbly and not holding together. The key apparently is in the amount of eggs. I substituted 25% of the coconut flour for almond flour and upped the cream for more liquid because almond flour absorbs more, I think 5tbsp. Also used cream of tartar to help the egg whites hold better. The results were truly outstanding on the first try. coconut flour absorbs more, not almond. You have that backwards. My inner Leslie Knoppe is satisfied! My wife & I are trying to stick to a low carb diet but needed a variation for breakfast instead of eggs scrambled, sunny-side up, poached, eggs, eggs, eggs etc etc. 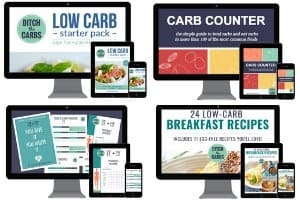 I thought, ‘what about low carb waffles’ ; the recipes that I came across were a stretch as the word waffle goes & then I was led to your site. I made them this morning(served with cream cheese & raspberry jam & bacon on the side). Not only were they good; they were fantastic. Light, fluffy, great taste & lightly browned. Released beautifully after they were done. The batter made 3 1/4 -7 inch size Belgian waffles. I followed the recipe to a T. Used whipping cream, Truvia & a little cream of tartar to help the egg whites. Two things are important (to me) when making the recipe: 1st-Combining ingredients- dry first-egg yolks with other liquids next minus the melted butter,then wet & dry combined together & then add the melted butter. Next gently fold the egg whites into the batter. 2nd-Don’t overfill the batter in the waffle maker. Smooth out the batter, in the waffle maker, with a rubber spatula. Per serving, so 1 waffle. Inlike practically everyone else, I thought these waffles were “meh” at best. The family ate them but said they tasted like French Toast. I will only make them again with modification to maken them taste less like eggs. Thank you for the great recipe…my granddaughter just loves having her peanut butter waffle sandwich for school lunches. However, I have made this recipe twice now and both times the mixture curdled. I don’t know if this is a problem with measurements as the recipe does not clarify if the tablespoon measurements are US tablespoons (15 ml) or Australian tablespoons (20 ml). Although the batter curdles, it still ends up working out OK, but I have to scrape the mixture onto the waffle maker rather than pour. Any advice would be very welcome. thanks Libby – are the measurements for tbs metric or US? How about adding more cream to your mixture. If batter looks too thick, add more fluid before mixing in the egg whites. End batter should be quite light & fluffy. I have to be honest.. I was a monster making these. I kept listing off all of the reasons they would be terrible in my mind. (I’ve been burned before!) But I dutifully pressed on. This. Was. Great! I loved them!! Hey! So excited to try this recipe out but I’m having trouble making sense of the nutritional info you have listed. I’ve matched every ingredient in my fitness pal but am getting 11g of carbs and 2 grams of fiber. This seems to be coming from using Swerve since 4TBS has 36 grams of carbs. Am I missing something or is your nutritional info off? You subtract sugar alcohols from the carb count. Try searching for “Swerve net carbs ” in mfp. I am curious for those who want crispy waffles, could they add xantham gum? I ask because in the not carb friendly recipes for waffles the best have cornstarch in them to crisp the outside. I don’t have a waffle iron to test this theory otherwise I would. 🙂 Alternately it is recommended that you put the waffles on a baking sheet in the oven on 125 degrees until ready to serve to help preserve them. I wouldn’t mess with this recipe. If u want a crisper waffle just leave in machine a few seconds longer than average. I found the texture is good. Not soggy & not too tough. No need for extra ingredients. Thanks for sharing ! This recipe is amazing. So excited to make these again !! Hi. I tried this waffle recipe and must say, it was amazing. I used coconut flour and alternated my milk for coconut milk instead. I didn’t include the vanilla extract but it still came out well. I used a pan which had grill lines so it gave me the waffles line effect! Lol. I was a it dry for me tho but I guess its cos I used lesser butter. I got 2 huge waffles from this and I could only eat one as I got really full. I’m glad I found this recipe and its been fun. Thanks for helping everyone that has tried this recipe with their journey in eating healthier. Hello! Thank you so much for your wonderful recipe. I tried it the first time and it worked great but subsequently I have got it all wrong, the mix is way too dry. Can you please confirm the weight of the coconut flour as opposed to the volume please as I think this may be the culprit. Also, the mix seemed to be lumpy, then I noticed the coconut flour in the sink making the same clumps in contact with water. Is this normal? These waffles are INCREDIBLE! I’ve been wanting to try them for a long time but I don’t often feel like subs anymore. So when my brother came to visit I used the opportunity to whip some of these up for him and my sister. They LOVED them and they aren’t even lchf! I tried a tiny bit to gauge and thought they were great. When eaten piping hot without toppings they have a very slight eggy taste but just let them cool down a few minutes and it’s gone. This is definitely a top recipe! I made these for breakfast this morning. They are wonderful! I have a Belgian waffle maker and I got 3 waffles from this recipe. My batter was never thin and I got the scrambled egg look even though I let the melted butter cool a bit before adding it. However, after reading some of the other reviews, I kept going. My husband was skeptical, but loved them too. He even told people at work about them and has referred them to your site. I ate mine with 2 strips of bacon and 1/2 cup raspberries with a little whipped cream at 7:30 am this morning. I was not hungry or snacky all the way up to lunch time. This is a first for me. I plan to make a larger batch and try freezing them for quick and easy breakfasts. Thank you so much for the recipe. It’s the first I’ve tried on your site. I’m excited to try more! How did the freezing/defrosting work out? Especially the defrosting. That is always the tricky bit. Made these tonight using heavy whipping cream in place of the milk, since it doesn’t have any sugar in it, did not use any sweetener, and only used 1 stick of butter because that’s what I had. They do taste a bit eggy, kind of like french toast, like another commenter mentioned, but my plan for this batch was to use it for breakfast sandwiches, so the eggy taste is no big deal. I’m looking forward to experimenting with the recipe. I made these in a belgium waffle maker so it made 2 big waffles, which I consider to be 4 servings. They were plenty fluffy, soft, but I like softer waffles. Plus, I’ll freeze them and reheat in the toaster, so they’ll crisp up a bit at that point. The first batch did stick and I lost half the waffle, so we taste tested with the ripped up portion :). Used more cooking spray on the second batch and that one came right out. WOW – fantastic waffles, they really are better than the high carb version. I used 1tbsp each flaxseed and almond meals in place of 1 tbs of coconut flour, and used coconut milk in place of the milk. We had them with some lightly cooked frozen blueberries and raspberries (with some Galliano), and cream cheese. These will be on the menu next weekend!! This recipe makes the most tasty low carb waffles EVER!. I topped mine with a couple sliced strawberries and low carb whipped cream. awesome. Yes. These are the best keto waffles in existence. I only tried these because of the keto goddess comment and these were going to be the last keto waffle recipe I would try ever in life ever. I’m so glad they lived up to the rave reviews. My only substitution is that instead of only coconut flour I used half flax meal and half coconut flour. Delicious. I also made pancakes with part of the batter and they were amazing as well. I made these today, trying to stay grain and sugar free after our most recent whole 30. Very, VERY yummy, good texture (not crisp but soft-fluffy, like french toast, as another commenter suggested), pretty easy to put together. They are quite filling! I considered doubling the recipe but am glad I didn’t, as I got 9-10 waffles out of the batch, enough to eat our fill & freeze 3. Recommended, all around! Life is good! I’ve been going to try your waffles for some time and today was the day! You said you modified the recipe from an old one you had. When I was a child, we always had waffles and pancakes from a recipe in a little cook book that was all recipes using apple cidar vinegar and baking soda. The chemical reaction of the two made them wonderfully light and fluffy. The waffle recipe had you separate the the eggs and beat them to stiff peaks as your recipe does. So instead of using the baking powder I substituted it with baking soda and used 1 tsp apple spider vinegar. I think I could have cut the cream back a bit or increased the coconut flour as the batter was a little thing but not much. They were wonderful! Thanks for your web site and all the work you do to make my LCHF lifestyle just a bit easier! Blessings! I can’t wait to try this. Some have mentioned butter replacement with ghee, but ghee is also dairy… I have coconut butter and am wondering if this will work instead of the butter? Yes some people who cannot tolerate dairy are able to tolerate ghee. I make ghee easily using Alton Brown method, (google it) and my lactose intolerant son can eat anything I make with it. If you cook it a long time it smells divine….like butterscotch! These were AMAZING! My husband (who is very picky about waffles/pancakes) said that he liked them better than regular waffles. These were soo good!!! What a difference whipping the egg whites does. I used heavy cream and two packets of truvia. No leftovers here!! Can’t wait to try more of your recipes ! It simply makes them light and fluffy. So glad you love them. You can leave the milk out (or use HWC as you did), again, this is to make them light. They can also be frozen then reheated or toasted. The highest compliments on this recipe. I’ve done low carb for some time and in trying carb substitutes have basically gotten to the point where if it doesn’t take good, I don’t bother with it. I absolute love waffles an have missed them. These are great! The closer you are to following the recipe and better the results. I also have removed the waffles and moved them on a sheet of parchment paper in the convection oven to crisp them a little further as well as keep them warm. Made them this morning for my celiacs child and was told these may be the best waffles of any type they’ve had. As a side not, I’m using Just Like Sugar (Table Top) which serves as a sweetener and big time fiber. Anyway, thanks for the time and effort in putting this together! These were amazing!! After I cooked them in the waffle maker I put them under the broiler and it really crisped them up!! Thank you! Great idea. I’m going to do this the next time I make some waffles. These are amazing thank you so much! I make these with ghee in place of the butter and unsweetened almond milk instead of cream because my hubby is paleo. We also do pancakes instead of waffles because we don’t have a waffle iron. They come out great 🙂 Thanks for the recipe. Thanks for letting us know your non-dairy substitutes worked so well. Love it. Does anyone have any tips for making these crispier? I loved the taste, but I prefer my waffles to be on the crispy side. I tried putting them in the toaster oven, and that just ended up with them almost burning. My husband has suggested frying them, but I haven’t tried that just yet. Thanks! We had these for breakfast this morning and they were delicious! I mean, incredible – as good as any waffle I’ve ever eaten. To be honest I’d never normally dream of having waffles for breakfast as pre-LCHF they would never fitted in to my low fat diet (that just made me fat) so to have them on the allowed list is immense. Thank you for such wonderful recipes, you obviously put in loads of work and I thank you for providing such an amazing resource. Ah my pleasure Kellie. And I’m so glad to hear you have lost the fear of fat (it takes a while huh?). I have another pancake recipe coming up soon, so stay tuned. I just made these, and they are fantastic. (I halved the recipe with 3 eggs and it all worked fine.) Trying the chicken and leek pie next! Thanks Libby. I was just gifted a mini waffle iron. I didn’t have the patience to whip the whites so I added a teeny bit more baking powder and they came out amazing! Probably would only work with smaller waffles but they rise without an issue. Yummy. Have not had pancake/waffles in a long time. I was very skeptical about making these, but I am in totally in love with them! Thank you so much! I asked for a waffle maker months ago for Christmas and then started a Keto diet! I was so sad thinking my waffle iron was going to go to waste. I have to admit, waffles with only 4T of “dry” ingredients just seems impossible, is it because you use so many eggs/the whites are whipped? I have a “sensitivity” (since that’s the word my naturopath likes to use) to egg whites & whey, so I’m going to try this with whipped aquafaba and coconut milk. FYI, The recipe I’m planning on using has <5% calories from carbohydrates, which seems INSANE to me! My weird tasting whole wheat/almond meal/protein powder waffles are 18% and I thought that was as low as you could go! Coconut flour is much more dense & absorbent vs regular flour. 1/3 to 1/4 cup of coconut flour is equivalent to 1 cup grain based flour. These sound fantastic, but ontop of having insulin resistance, wheat allergies, and sugar issues, we also have milk allergies. Do you think cashew milk would work? Isn’t there sugar in the milk? ingredient, only gets the batter to be less thick. Hi, I made these. They tasted great, but the weren’t crispy at all. Any ideas where I may have gone wrong? mine weren’t crispy either. Where are we going wrong? Honestly, I bought a waffle maker just for this recipe. So, I am rookie. Any help is appreciated. Same 😭 They taste amazing but I’d love if they were crispy! Could it be the type of waffle maker? Please help. I’m allergic to coconut. I would like to try these waffles. Is there an alternative? Hi Angel, I use Besan flour otherwise known as chickpea four, hope this helps. You can use Almond flour. I am making them right now. They are delicious! Are you using the same amount 1:1 ? Thanks ! I made these for the first time today. Although I followed the recipe closely, the consistency was quite different from the one in your video – the dough looked like scrambled eggs so I was quite sceptical. Nevertheless the results were fantastic and it tastes unbelievably. Another great keto breakfast or dessert. Thanks for the recipe! Can you use gluten free oat flour instead? They cannot be exchanged equally as coconut flour is so absorbent and has completely different properties than any other flour. Read this article which may help. Just made these and they are delicious!!! So light compared to other options I’ve tried! excited to freeze the rest and enjoy them for breakfast during the week! Let me tell you, I HATE eggs! I hate them, I wouldn’t even eat french toast growing up because I could taste the egg batter on them. But these are magical! What kind of sorcery is involved here as they don’t taste eggy at all!!!!!! They were amazingly fluffy. I used Sweetleaf Sweet Drops instead of granulated and added 1/4 tsp cinnamon.. They were amazing and 2 filled me up!!! i thought they were vary eggy… liked them but eggy… a little less would be nice..
Oh sweet baby Jesus! I just made these and I can’t believe how delicious are they! With some whipped cream and fresh strawberries it was just like the real thing! Thank you so much!!!! I’m a fan! I laughed and laughed at your comment this morning. I will smile and giggle remembering it all day. Love it. Do you mean the weight of each waffle? I’ve never measured them but I know the mixture makes 5 waffles. Can the coconut flour be substituted with almond flour? No sorry, they have completely different properties. Take a look at my ultimate guide to low carb flours. Can the sweetener be reduced? I increased recipe for 20 and it seems like a lot of seeetener. I am 64, an experienced Baker/cook. I follow this recipe to a T, except that I folded a quarter of the egg whites into the egg yolk mixture before I combined the two in the egg whites bowl, and I used granulated Splenda. I have a standard George Foreman grill with waffle plates. I got four large waffles out of this recipe. That changed the nutritional calculations, so I used the free MyFitnessPal app, which has a recipe calculator in it, to figure out the nutrition. Not all waffle irons are alike. My old waffle iron was smaller, and would’ve made 5 from this recipe. Also, I found these waffles give off a lot of steam. I baked them 4 minutes on high setting. I put them on a cake rack for a minute or two, to lose more of the steam and crisp up. Otherwise they were limp. Ymmv. I loved these. Had them for dinner. Stewed frozen raspberries with splash lemon juice and vanilla, ricotta, cream and a teaspoon of sugar free cherry jam. Cinnamon sprinkle on top. Heaven! Home grown eggs from our chickens called Neville, Lay Lay, Coco, Peanutbutter and Strawberry Lollipop. Eggs with love.Scraps will go back to them tomorrow( I was full after one and a half waffles!!) Thankyou DTC’s. I am thrilled you love it so much, and your son also. Have you tried my pizza waffles? They can be made ahead of time then just pop them in the oven with your choice of toppings – enjoy. I am new to the Keto food lifestyle. This recipe was the first waffle recipe I’ve tried & there are not enough words to describe how great they are. I had to substitute the coconut powder for almond powder; heavy whipping cream for the milk & used unsalted sweet cream butter. I put my wild blackberry jam with stevia on them & the flavors were fantastic!!!! Thank you Google for having this recipe first on the list!!! Yes it would work. This is exactly what I do when I have a pizza party for teenage sleepovers (using the pizza waffles). I make the waffles the night before or in the morning. Keep them in an airtight container then reheat them the next day in the oven. If you don’t have an oven, you could microwave them (they may be a bit floppy however) or warm them in a sandwich/panini press. Enjoy. Hi Libby, I’m looking for a crepes recipie with simple ingredients that I can flip without making a mess. Could be this one? How can I adjust the amount of flour to get thin but unbroken crepes? Did you try it? Thanks a lot for all your great work!! These are fabulous. Yes you can make them in the frying pan. I haven’t (I love my waffle maker) but some readers here have commented here and on Facebook they have and they flipped well. I’m sure the ghee will be fine, the almond milk however may not be high enough in fat. If it doesn’t work, try some coconut milk (if you can tolerate that). These really are amazing. Enjoy. Hi Libby. I just started keto about 3 days ago. Am wondering if whole milk could be replaced with half/half since it has less carbs than milk. Wadda ya think? I’m eager to try this recipe! … especially since it is pretty simple and has gotten rave reviews! I have never used half/half (I had to google it to see what it is) but I’m sure that would work, and being lower in carbs, it’s a brilliant idea. I made these today, the first waffle I made tasted like eggs. I ended up adding more vanilla and cinnamon and 1/2 cup of almond flour, folded them into the batter. So much better. Drizzled melted peanut butter and coconut butter on top. Yum! OMG, these are FANTASTIC!!!! I’ve been looking for a legit waffle/pancake recipe, and this is it! So easy, and with ingredients I already had on hand which is always a bonus. I’m literally eating them right now while I type this. 🙂 I hope this is ok – I put a review on my Keto RN site (https://www.facebook.com/KetoRN/) and linked back to this page to give you the credit. This is SO GOOD! Thank you!! Thanks Addie, glad you liked them so much. it is soon becoming an absolute favourite recipe here. These are great, as good or better than regular waffles. Thank you. I don’t believe in artificial sweeteners, including stevia, as I believe they are all bad for us. Do thee waffles need to be sweetened? My pre-keto waffle recipe didn’t have sugar so I wondering if these will turn out without the stevia. Stevia is not artificial, it comes from the stevia plant and no you don’t need to sweeten them. That is completely up to you which I why all my recipes say “sweetener of choice to taste”. Maybe try erythritol. It might be gentler for you? Kto Waffles sound amazing. I suffer from IBS and fructose, Lactose and gluten intolerant. Coconut flour can be a problem on the IBS ( low fodmap diet). Take out 1/3 of the coconut flour and add twice that amount of almond flour and you get a little denser waffle that comes out of the waffle maker easier. Also, if you add the vanilla last, and double the amount but stir less, just so you still see streaks, you get crunchy and sweet chunks in the waffle that taste a little like heath bars. I always read comments on food blogs, but I never leave any. These waffles are so good that I can’t remain silent this time. I have tried numerous Keto waffle recipes (all those expensive wasted ingredients) and have been disappointed every single time… until now. I went into making these with a whole lot of skepticism (especially because of the coconut flour) and expecting to be let down like usual. Boy was I surprised after that first waffle came out of the waffle iron! These are the closest thing to a carb and sugar loaded waffle that I’ve come across since going Keto. I ate mine sprinkled only with cinnamon. I’m betting they are even better with a topping. I did use Erythritol instead of stevia and only 1tbsp which was plenty sweet enough for me. That was the only alteration I made. Thank you so much for this amazing recipe! Will definitely be making these again and again. I just wanted to say that these keto waffles are amazing! I eat them plain with nothing on them. I wanted to share that I actually turned a batch of leftovers into French toast…..close your eyes good, no exaggeration. Sooooo, that led to monte cristo sandwiches that were truly mind blowing. This recipe has quickly become my go to bread recipe! One of the best recipes I’ve come across so far in my low carb life. Thank you, thank you! Is there an alternative to the milk we could use to get the sugar down to 0g? Yes, you can use some coconut cream, almond milk or any other liquid to thin the batter a little. I love the thought of you with your makita drill making my keto waffles. I love DIY and my power tools, so I’m with you on this. Hey do you ever add sugar free chocolate chips to this? Sure, that would be amazing. They are expensive here and my children don’t miss them so we have managed to go without. Sure, the waffles will turn out a little heavier but I’m sure they would be amazing. I just made these and I used 2T of Heavy whipping cream and 1T water instead of whole milk. Worked great. Great stuff! I love it when readers adapt my recipes and let me know their great tips. Thank you. Not sure if I did something wrong or its my waffle iron or what, but are these supposed to come out really floppy? Mine are really limp and one even tore apart getting out of the iron. The taste is great, but I was really expecting that stiff somewhat crunchy texture. They are supposed to be browned and a little firm on the outside and fluffy on the inside. They are certainly not crispy as waffles are usually crispy from the sugar. They shouldn’t tear apart. I’m thinking you need more coconut flour perhaps depending on the size of eggs you used. I write total carbs then each reader can decide if they are counting total or net by deducting the fibre. Which stevia are you using? Because that much pure stevia would be way too sweet, to the point of being inedible. Is yours a blend with another bulking sweetener? I can easily figure out how much pure stevia is needed once I know what brand you are using, thanks. Yes the stevia I use is granulated and measure spoon for spoon in place of sugar. I use Natvia or Swerve. Take a look at this page to see my other pantry ingredients. Absolutely the best in the world. I’m deleting all the other pancake and waffles I have collected over the years. I actually had to buy a new waffle iron too, as I had gotten rid of mine years ago. Made these this morning in a regular waffle maker! It made two regular size waffles. I imagine the ones you are making here are quite small since you say this recipe serves 5 (and we made two). I just want to make sure I understand – since you say it serves 5 and the macro-nutrient information is per 1 serving – I would multiple by that by 5 to get the TOTAL nutrition info, yes? Just wanting to make sure. I only ate 1/2 of my waffle anyways 🙂 It was VERY good! I just went and measured my waffle maker, the waffles are 6 inch/ 15 cm in diameter. The entire recipe makes 5 waffles, the nutrition is per waffle. Yes to get the total nutrition values for the entire recipe, you need to multiply it by 5. You must have a enormous waffle maker if it only makes 2 and you could only finish half. Wow. O.m.g. I just made these for breakfast and they were absolutely amazing!! I didn’t have enough butter (only about 7 tbs) and no milk in the fridge so I used half and half and liquid sugar free French vanilla creamer to add to the required liquids (and didn’t use any other sweeteners to sweeten them either, creamer was enough) and the waffles turned out fantastic! My bf who doesn’t really eat low carb (unless I’m cooking and he has no choice hehe) had the first waffle and said they tasted kinda eggy, but then quickly said “like french toast” which made me really excited, because I looove and miss french toast! I topped mine with sugar free apricot preserves and french vanilla flavored whipped topping. I told my bf you are an amazing person for coming up with this recipe as these are going to be my weekend breakfast from now on!! Oh, I used my Belgian waffle maker and only got 3 waffles out of it, but I can’t wait to use the recipe for other things like breakfast sandwiches, etc. Yummm. Anyways, thank you, Keto Goddess!! I am so loving being named the keto goddess. I’ll dream up some more amazing things for you. Watch out for what I will post by this afternoon – amazing!!!!! Marina, check if your sugar free French vanilla creamer has high fructose corn syrup. That would increase the carbs measurably. I used to use the “sugar free” creamer until I checked the ingredients list!!! The almond milk may be too thin and watery for the waffle, the coconut cream would be great although it may add a coconut flavour to the pancakes – which may be a bonus if you love coconut. I’m sure that would work. It can even be cooked in the frying pan and one reader used a sandwich press. 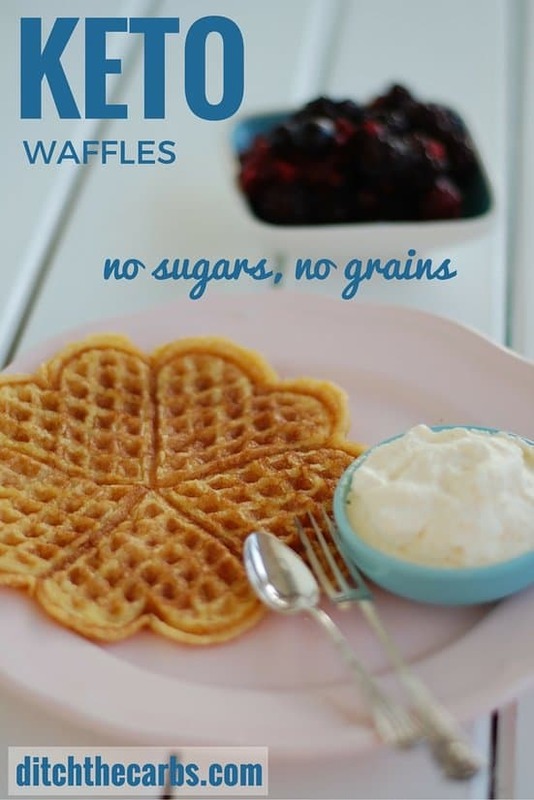 THE best grain free waffles in the world!!! My 2 yo loves them as well! Thanks so much for this recipe! Freezes well and we put them in the toaster quickly to warm them up, top with butter and enjoy! Also, we don’t put any sugar in them and they are still amazing! Good to know! I’m very against artificial sweeteners and we’re LCHF so I cry a little issue when I read stevia or erithrytol in a recipe. These showed up on my FB time line. 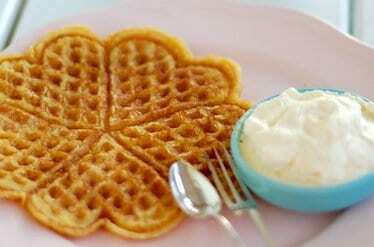 I’ve ordered a non stick waffle maker just for this recipe! My only thought is did you still use butter or coconut oil to grease the waffle maker? When I bake with coconut flour, I found no matter how well I greased the pan, the item stuck! I finally resorted to using silicon bakeware. I would like to make these successfully without making a mess of it! Any tips appreciated! I generally spray the waffle maker for the very first waffle then the butter that comes out of each waffle as it is cooking is enough to ensure the next one doesn’t stick. Thanks for that tip, will give it a try! They turned out amazing, my husband loved them as well! We had them with strawberries and homemade ice cream sweetened with Natvia. Today we had them with strawberries and whipped cream! I’m going to make chocolate ones next time! Oh my word ! I made these into pancakes and as they are cooking I’m thinking ” There is no way these are going to work” and then suddenly they firm up into fluffy heaven cakes and I realize that yes, I really can survive low carb. We low carbies eat good! Well it’s pancake day today in the UK! Determined to stay off sugar we made this recipe without the stevia initially to see how we would like it. It was ok, then we added a tiny amount of stevia to the remaining mixture and that was very nice, we used coconut oil to cook them as pancakes, then added a strawberry with double cream topping. We ate far too much and are now stuffed!!! You could try coconut oil but you may need to add some more vanilla as the butter is there for flavour and texture. You could even add cinnamon too. The butter gives it a rich creamy taste so you may have to play around with the recipe a little to get it to your liking. I’d love you to report back if it works. This may be too much of a change but is there a way to make these paleo AIP friendly? So it would need to be dairy free and egg free, so coconut milk would work for milk but would need a substitute for eggs and butter? No that would change this particular recipe entirely but what a fantastic suggestion for future recipes. What ingredients would be suitable for you? Daisy, if I may, here are some options to check out, not a definitive answer. I was once p-aip myself, and sometimes go back to if autoinflammatory symptoms seem to be creeping back. For the eggs, try making gelatin eggs, I use the red can of Great Lakes Unflavored as it is easy to find where I live, just gelatin and water (a quick internet search will provide the ratios). For the butter, Ghee if not allergic/intolerant, or some sort of solid fat (i.e. coconut oil, beef fat, pork fat, duck fat, etc.). HOWEVER, you will need to determine carb counts for each of these options and the amounts used. Probably not as coconut flour and almond flour have different properties. If you don’t want to use coconut flour, psyllium husks may work? The coconut flour is there to bind the ingredients and make the waffles sturdy. I used almond flour today and it worked for me. I also used heavy whipping cream instead of milk. It was very tasty! How many tblsp is 4.5ozs? Don’t have anything to weigh by ozs. Thank you, definitely going to do these! 125g is equivalent to 1 stick of butter (110g) plus one tablespoon (15g) (according to Google – I hope that is correct). Yes, and I do. Freeze in an airtight container and place a piece of baking paper in between each waffle to stop them from sticking to each other. Oh! And sometimes I add cocoa powder too for fun. We use a recipe like this. The kids love it! Yours are so pretty, looking like hearts! Made with love! Hi, The coconut is also a nut. I dont have a waffle maker. can i fry it in the pan like a pancake maybe? Sure thing. They flip and turn really easily. Libby, is the waffle pictured the size of the waffle indicated as one serving? 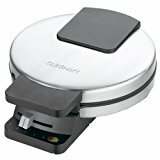 My waffle maker is a lot smaller than that and makes 2 square waffles – I’m trying to figure out how many waffles the recipe might make with my smaller machine! Yes I serve the waffle shown as one serving, the recipe will make 5 so adjust the nutrition according to how many you manage to make in your waffle maker. Wow! These are scrumptious ! Thanks for the recipe! I used heavy whipping cream as I didn’t have milk and they turned out so light and yummy! Terry that’s great to hear you have made them so quickly after I have just posted the recipe and they turned out so well. I think they may soon become a regular for many families now. I did make them soon after you posted! I was hungry and saw those and thought I’d give them a try! I’ve shared the recipe with several family members and can’t wait to see what they think! Makes LCHF fun ! Thanks! do these taste real eggy? No not at all. I have made these so many times and never once do they taste eggy. I love using plenty of vanilla and they are incredible. Will full fat coconut milk work in the recipe? I’m sure that would work, it may just add a bit of a coconut flavour to the waffle. Hi Libby, I can’t have milk products. Do you think this recipe would work if I replaced the 3 tbsp full fat milk with 3 tbsp coconut cream? Thanks. Sure thing. It will add a coconut flavour however. Wow, these sound amazing! I don’t have a waffle maker, but will definitely be making pancakes!